Simone Martini (1284–1344) was an Italian painter born in Siena. He was a major figure in the development of early Italian painting and greatly influenced the development of the International Gothic style. It is thought that Martini was a pupil of Duccio di Buoninsegna, the leading Sienese painter of his time. His brother-in-law was the artist Lippo Memmi. Very little documentation survives regarding Simone's life, and many attributions are debated by art historians. 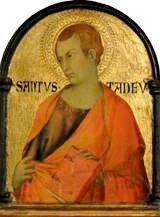 Simone Martini died while in the service of the Papal court at Avignon in 1344.